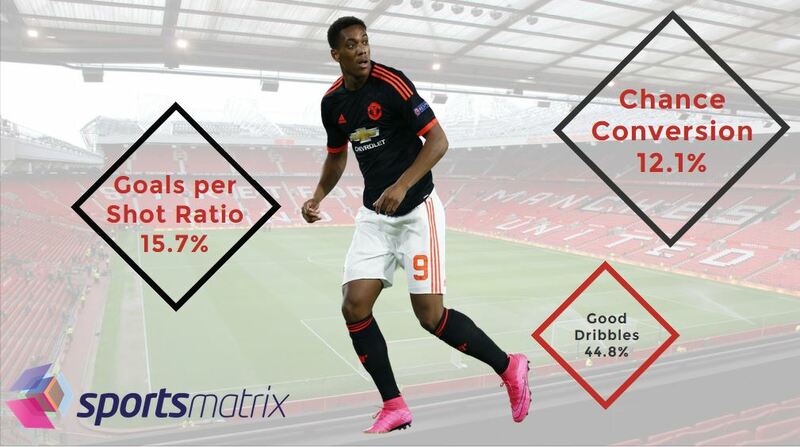 sportsmatrix » Can Anthony Martial Become a Manchester United great? Manchester United’s decision to spend in excess of £35 million for a 19 year old was derided as being a last minute panic buy. But with the exciting young Frenchman having netted three times and provided an assist in the Premier League in just over 200 minutes of football, it looks as if the last laugh is with those at Old Trafford. Sportsmatrix dug into their database and examined Anthony Martial’s performances over the course of last season, to see what attracted Manchester United to the player. Taking into account his contribution in 35 games during the 2014-15 season his defensive contribution for AS Monaco was worse than average, whilst he rated slightly better than average at converting chances into goals. Manchester United play short passing possession football, but Martial showed that when the ball is hit long, he has no problem in dealing with it, with good actions from 30% of long balls faced, this compares to a league average of 23% good actions. He didn’t rank particularly highly when shooting on goal, averaging fewer shots per game (2.7) than average (3.2), with a lower percentage of dangerous shots, yet he still scored a higher percentage of goals per shot (15.7%) than average (12.8%). But there were two areas in which Martial stood out, the first being his one-on-one skills. Whereas the average number of dribbles per game for a comparable player was 6.7, Martial averaged 12.3 dribbles per game, representing almost a quarter of his team’s dribbles. Even more impressive were the quality of his dribbles, with 45% rated as being good, compared to the league average of 34%. From these dribbles Martial created on average one chance per game, compared to the average of 0.3 chances per game. Unsurprisingly the other parameter in which Martial excelled was in chance creation. He made almost seven attempts per game at creating chances, compared to an average per game of 4.5. From these attempts he averaged 1.8 chances created per game, well in excess of the average of 1.1 per game. Seven games into the new season and Manchester United find themselves heading the league for the first time in three seasons. Whilst it’s early days there is no doubt that the emergence of a 19 year old Frenchman is exciting the Old Trafford faithful just as it did with the arrival of a young Portuguese player back in 2003.